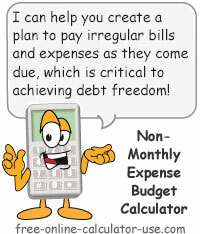 This calculator will help with personal budget planning by translating any expenditure into its daily, weekly, monthly, annual, work-years, and life-expectancy equivalents. For example, if you spend $3 for coffee 5-times per week, this calculator will tell you how much you are spending per day, week, month, year, work-years, and lifetime! Plus, the calculator will even translate each periodic equivalent into the number of work hours required, and the interest earnings you stand to lose if you spend the amount instead of invest it. 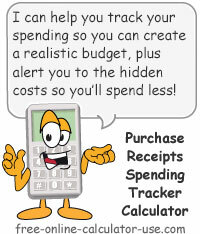 So in addition to helping you to translate dollar amounts to match your budget period, the calculator may also help you to reduce or avoid indiscriminate spending -- and the buyer's remorse that comes with it. The secret to budgeting finances for maximum returns. Translate an expense into 6 periodic equivalents and become aware of the cost to you in terms of lost discretionary time and interest earnings. This section is for entering decision making data that will be used for any and all spending habits you enter in the next section. Enter your current age as a whole number. Enter the age you plan to retire at. Enter as a whole number. Enter the age you expect to live until. Clicking on the link will open the Life Expectancy Quiz in a new window. Enter the annual percentage return you expect to earn on your investments. Enter as a percentage, but without the percent sign (for .06 or 6%, enter 6). Enter your real hourly wage (RHW), which is the after-tax, after work-related expense wage earned per hour devoted to working. Enter as a dollar amount, but without the dollar sign and any commas. If you do not know your RHW, click the link to open the real hourly wage calculator in a new window. Enter a spending habit's name, amount per expenditure, and number of times per period, and then select the spending period. Once you have completed the fields, tap the "Translate Spending Habit" button. 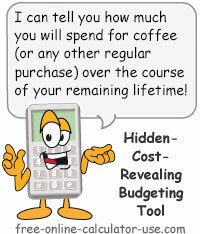 Enter a short description of the spending habit (coffee, dining out, cable, gambling, etc.). Enter the amount you typically pay at one time. Enter as a dollar amount, but without the dollar sign and any commas. Enter the number times per period (on next line) you expend the amount on the previous line. Select the period that the number on the previous line pertains to. 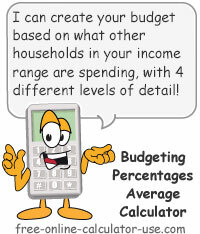 This sections shows the spending habit's dollar amount translated to 6 different spending periods. The Work Hours column shows the number of hours you will need to work each time period to pay for the dollar amount. The Lost Interest Earnings column shows how much interest you could have earned on the period's dollar amount between now and when you retire (or at your life expectancy, in the case of Life years), if you had invested the amount instead of spent it. The Total Cost column is the total of the Dollar Amount column and the Lost Interest Earnings column. Enter your current, retirement, and life expectancy ages. Enter the annual percentage you expect to earn on your investments. Enter your real hourly wage (after tax and work-related expenses). Enter a spending habit's name, amount per expenditure, and number of expenditures per selected period. Click the "Translate Spending Habit" button and scroll down to view the results. How to budget finances for maximum returns. What if I told you that if you invest money with me you would get $100 back? Would you take me up on my offer? Well, I'm guessing you would first want to know how much you would have to invest. After all, if you invested $1,000 and I only gave you $100 of your investment back, you probably would not be very happy with your return on investment. Unfortunately, if you're like most people I talk with, you are investing money every day without ever considering what you are giving up in return for what you are getting back. I'm talking about the money you spend for goods and services. What most people fail to realize, is that when you spend money for a product or service for which the value diminishes with time and use, you are simultaneously giving up two things. First, you are giving up the number of hours you had to allocate to work in order to earn the after-tax, after-work-related-expense income to make the purchase. And second, you are giving up the right to earn interest on that money ... for the rest of your life. How many work-hours each expenditure will cost you. The amount of interest earnings you will forfeit. Becoming fully aware of those two figures is the only way you can predetermine if what you get from an expenditure is worth what you are giving up in the process. Otherwise, if what you give up in exchange for what you get is not important to you, then I will gladly give you $100 for every $1,000 you give me.